Nepal has a very long history of wood carving. Kathmandu, the capital of Nepal, is named after a very large wooden temple known as 'Kastamandap'. In Sanskrit 'Kastha' means wood and 'Mandap' means a special place made with great skill. 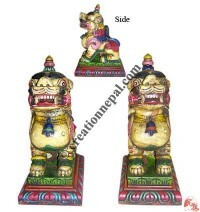 One can see wonderful wood carving around the city as a proof of Nepalis' wood carving skill.